06/12/2012 AFD: 16.8, SD: 3.5, CV: 20.7, %>30: .4 WOW!!! Motivator is in the TOP 1% of 2017 EPD's!!! Mo ranked in the TOP 1% of 2014 and 2015 EDP's. This preeminent male has earned 29 Championships, 9 Judges Choice Awards, 7 Best Crimp Awards, 7 Get- of-Sire awards, and is producing Champion and award-winning offspring! Motivator is awarded his 7th Blue ribbon in 'Get of Sire' at GWAS 2015 in fleece! 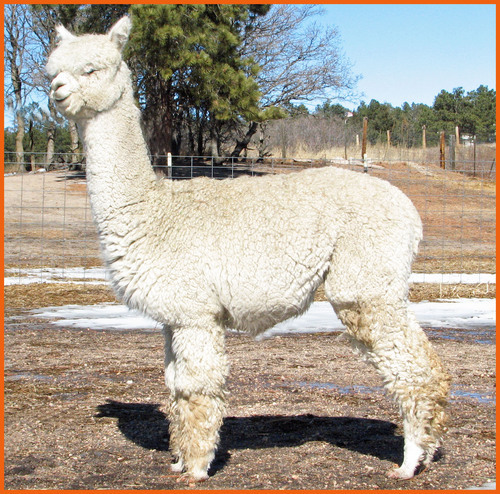 Deliciosa is a sweet, bright white female with a soft handling, very consistent, crimpy, fine fleece. She is a nicely balanced, structurally correct, solidly built, very low maintenance female. She has a wonderful personality; calm, curious and easy to handle. Deliciosa has proven to be without a doubt one of our best mothers, carefully attending to her cria, yet allowing us to interact with both her and the cria when necessary. Deliciosa has Oro lineage from her dam, Babette: a big bay black girl who has the personality to match. Her sire, Pepano, originally from Canada, is son of Jolimont Ivano, who produced many champion offspring in his career. Deliciosa has color genetics. She has a beautiful, white female, Perla, with 26X champion TP Poseidon's Motivator. Motivator is passing on his fabulous attributes - Perla is wonderfully conformed with very bright, crimpy, dense and fine fiber. Perla's fiber statistics: AFD: 17.9, SD: 3.6, CV: 20.1, %>30: 1.2. 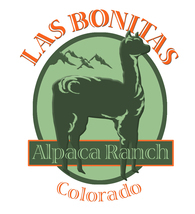 Las Bonitas' Perla was awarded 6th place of 11 in the extremely competive yearling white class at 2012 GWAS. Deliciosa is passing through her nice fiber qualities, as well as those of her service sire. 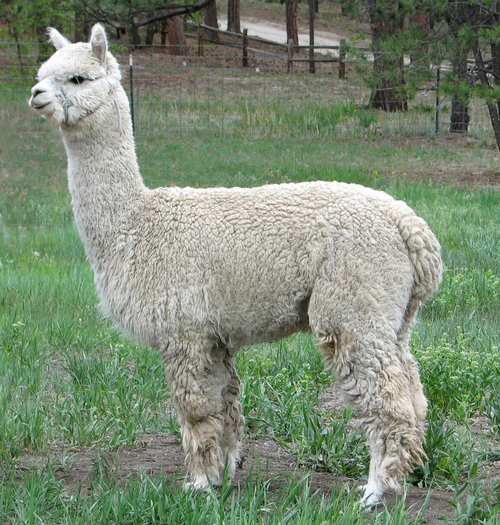 Deliciosa has been bred to the 2011 AOBA National Reserve Color Champion Sunny Mesa's Ares de Archangel for a mid-summer 2013 cria. Ares, an Archangel son who retain sought after lingering fineness; his 4th histogram shows an AFD of 18 with incredible consistency. Deliciosa, loaded with color genetics, will be a wonderful addition as a foundation female who has the ability to not only pass through her fine, consistent fiber and solid conformational qualities but those of the male's as well. Las Bonitas Alpaca Ranch, LLC is pleased to offer Deliciosa for sale. This bright and lovely daughter of TP Poseidon's Motivator is all about FINENESS and CONSISTENCY; a trend we are seeing in Motivator progeny. 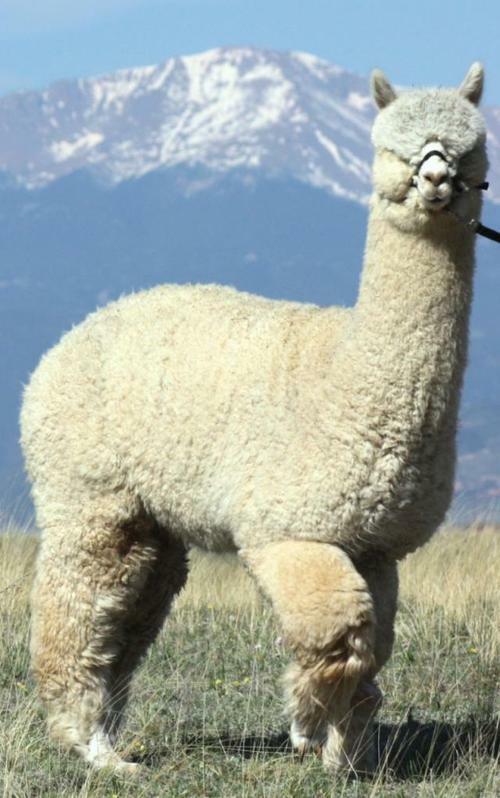 Her amazing fiber statistics for 2014: AFD: 19.1, SD: 4, CV: 21, %>30: 1.1 indicate that her fleece carries lingering fineness, a highly sought after industry trait. Her fine, consistent, long white staples cover her nicely balanced, heavy boned frame. 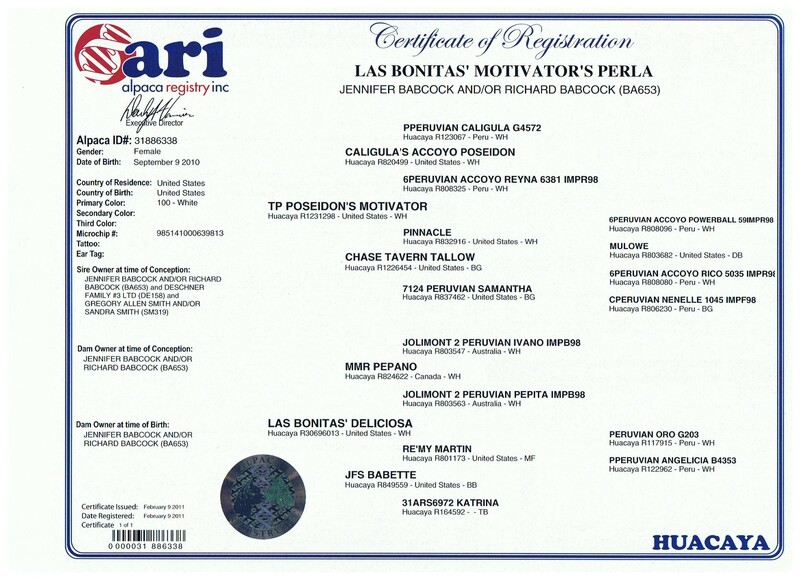 Perla has the wonderful lineage of TP Poseidon's Motivator including Poseidon, Accoyo Rico and Accoyo Powerball as well as Peruvian Oro and the Australian lines of Jolimont 2 Peruvian Pepita and Jolimont 2 Peruvian Ivano. There are color genetics, too, through her grand dam, JFS Babette, a bay black female. 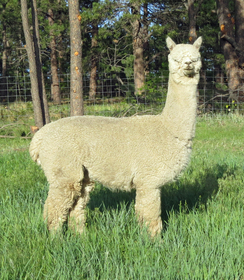 Perla is the proud dam to an 8X Champion Corazon di Bella Vita male who is Incredibly dense, very fine, and oh! so curly. We were positively thrilled with what Perla has produced! Perla will be the perfect addition to your herd, adding the championship genetics of TP Poseidon's Motivator, and lingering fineness and consistency. Perla is available with a breeding to any fully=owned Las Bonitas herd sire. Please contact Jennifer for more information.